It’s where we find our people and when we come most alive! I guess some would call that “kindred spirit” connections. What makes it more beautiful is when that passion is used to worship God. In removing barriers & being squeezed enough to move, learning that I’m approved by God, and embracing Stirrer Friends, I’m learning how to cultivate those “these are my people” friendships. with people who share our passions. When we come together, we not only rehearse, write, or take care of business, but we build community and family. It’s when we open our hearts to be seen, and possibilities of growth that we become more fulfilled in our God given giftings. We can then stop focusing on what gets us “ahead” and start cheering our friends on because its toward a common goal; God’s glory! Craving Connection: 30 Challenges for Real-Life Engagement! I found great joy in reading devotionals like the one that inspired this post from the women of (in)courage! 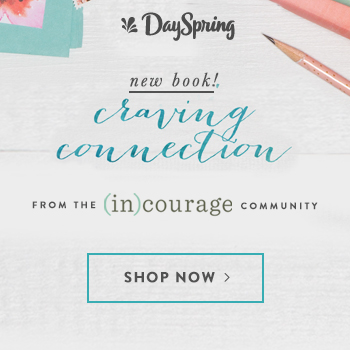 A little about Craving Connection from the DaySpring website! I find each devotional gripping and needed; digging into the heart of each matter, each woman gives a devotional, Scripture to apply, prayers, and challenge questions that will help in connecting with women in our lives. work. Live in peace with each other. The encouragement doesn’t stop there! Along with the chance of reading the Craving Connection devotional, I am able to send special messages to my dear sisters from the POSTCARD BOOK, inspire with the Clip Frame and Art Print Set, and gift the “Share One” necklace as I “Wear One” necklace! Craving Connection, these gifts and more are now available for purchase, and for those who purchase the book from DaySpring.com during Jan. 10th– 15th will receive this free mug with their order! *I received Craving Connection and all of the other gifts photographed in this blog post from DaySpring for book launch and honest review purposes. I will collect any money for this review, however, this review does contain affiliate links and if products are purchased through those links, I will, at some point receive compensation. Thank you for supporting my ministry!